I'm sure you know about this kind of vegetable. Yups, parsley. This green leaf that usually we use for garnish is very good and rich in nutrients. Parsley contains vitamin C which is high enough. 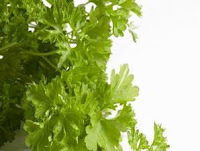 Half cup fresh parsley leaves contain 40 mg of vitamin C or the equivalent of half a fresh orange. The other benefit is overcoming interference from PMS bloating (premenstrual syndrome). So, do not throw away this beautiful leaf from your plate.